One of the most relevant cosmetic-industry trends in recent years – “blue light protection” – is also one of the most widely misunderstood; this article will help dispel some of the mysteries surrounding the concept of skin damage from exposure to digital screens. A recent study by Gattefossé examined eight different devices (Apple iPhone 4S, Apple iPhone 5S, Samsung Galaxy S4, Apple iPad 2, Samsung Galaxy Tab, Samsung Galaxy Note2, DELL screen U2312MHT, DELL screen E7440) with a high spectral resolution spectrophotometer, and found that the artificial visible light (AVL) from all of these screens is composed of three distinct peaks in the spectrum, corresponding to blue, green and red light in equal parts (See Figure 1). Figure 1. Peaks represent the dominant wavelengths emitted by the devices tested. Therefore, any study of potential damage from artificial visible light (AVL) must cover the full spectrum of blue, green and red, not just “blue light” alone. As we all know, sunlight produces UV radiation that can damage the skin via the generation of free radicals; we protect ourselves against UVA and UVB rays by using sunscreens (with organic and/or inorganic filters) that act to prevent DNA damage that can result in age spots, deep wrinkles, dry skin and potentially skin cancer. But AVL is in the visible spectrum and does not carry the same potential for damage – so it cannot be treated in the same manner! In other words, while AVL causes some generation of free radicals in the skin, these free radicals are NOT the main driver of damage (see below), so a simple sunscreen or free radical scavenging ingredient (antioxidant) will not sufficiently protect your skin from AVL-induced damage. So what does AVL actually do? Therefore, exposure to AVL damages the energetic machinery of skin cells and weakens their mobility and communication properties, resulting in increased cellular fatigue. Exhausted and isolated, fibroblasts are less able to produce key matrix components and less functional to interact with their environment, hindering proper matrix remodeling process. In plain English, your skin will look duller, faded, with less vitality and “glow”. Protection against AVL – This is not a passing trend! Protection against AVL, also referred to as “digital pollution”, is becoming a critical part of today’s personal care routine. Gattefossé’s Lauren DelDotto said, “According to a recent study, the time spent on smartphones by millennials is estimated at 3.2 hours a day = 22 hours a week = 49 days a year1. Another report records that US consumers own 4 digital devices on average and spend 60 hours a week consuming content through digital media2.” And these figures are only for leisure activities and do NOT count time spent in front of screens for work activities. The use of digital screens is a permanent part of our lives and will only increase. Think about what you do as soon as your alarm goes off in the morning – before eating, showering, dressing or preparing for work, you pick up your smartphone and check out what’s been happening, thus receiving an immediate and direct dose of AVL before you even get out of bed. Consumers are beginning to be concerned about this, and are looking for ways to protect themselves. 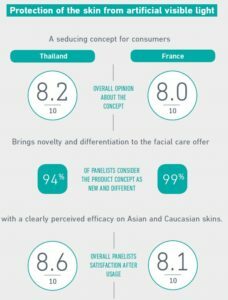 A recent Gattefossé consumer study conducted in both Thailand (to gauge consumer reaction from the Asia Pacific/Eastern market) and in France (for reaction from the European/Western market) found over 80% of the subjects found the concept of screen-light protection “seducing”, and over 90% of the subjects found the concept “brings novelty and differentiation to the facial care offer”. Figure 3. Consumer test conclusions on the AVL concept and novelty. Blue light is not the whole story – you must test against the full spectrum of artificial visible light (AVL), equal parts blue, green and red wavelengths. AVL is not sunlight – and you cannot protect against AVL the same way you protect against the sun’s rays. UV filters and antioxidants will not be effective against digital pollution; you need an active that protects against the actual effects of AVL – disruption of the mitochondrial network and disorganization of the cellular cytoskeleton. The “trend” is here to stay – screens are getting larger (100 inch TV, anyone? ), more prevalent, and most people use multiple screens at the same time. Consumers are receptive, and eager, to incorporate AVL-protection into their normal skin care routine. Ben Blinder is the Senior Director for Gattefossé USA – Personal Care Division, where he is responsible for the strategic direction and performance of the cosmetic business for Gattefossé in the US and Mexico. 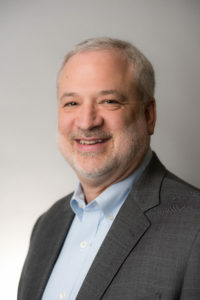 Ben holds a chemical engineering degree from Lehigh University and has been working in the personal care industry for 32 years, with extensive experience in strategic and long-range planning, sales and technical management, and new technology search/discovery. Ben also serves on the NYSCC Scientific Committee.